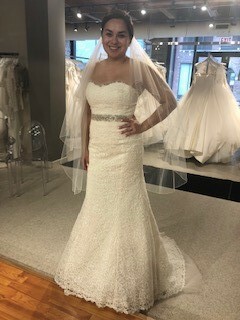 I bought this wedding dress from Glamour Closet in April of 2018. Glamour closet is an upscale wedding dress boutique that sells sample dresses in perfect condition. I ultimately fell in love with another style wedding dress, and never wore this one, even though I would have loved to! This is one stunning and elegant dress! It's lace, touches of tulle, and buttons down the back are just all beautifully designed by Carolina. The dress does an amazing job of hugging all the right spots, as the boning of dress really keeps things together, making you look and feel your best.